Friday morning, walking down Mission, stopped in my tracks by frantic shouts of, “Whoa! Whoa! 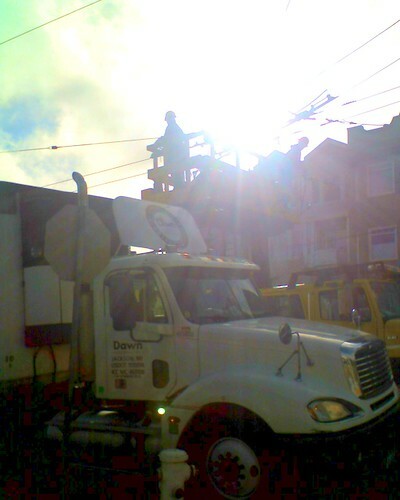 WHOA!” The overhead wire technicians were up on their elevated platform (their vehicle parked in one of Mission Street’s center lanes) performing repairs to a section of track that serves the 14, the 24, and the 49, when this semi tries to sneak past. The driver heard the shouts and stopped inches before his trailer ripped the workers right out of the sky. I guess it’s brushes with death like this that justify those guys being allowed to double park in front of La Taqueria when the rest of us cain’t.